This general contractor specializing in commercial interiors was moving from one floor to another within the same building. 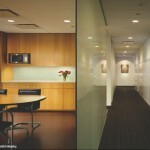 The contractor’s goal was for their new space to obtain LEED Gold certification for Commercial Interiors. 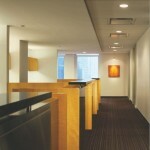 Having the client relocating within the building provided the design team great opportunities for reuse of materials, realistic pricing of design alternatives and help with sourcing products. Minor changes to the layout of the space allowed for much of the existing office materials to be re-used including: millwork, doors & frames, glass wall partitions, accent lighting and furniture. New materials were selected for green attributes including Greenguard certified carpet, recycled glass terrazzo & cork flooring, bamboo millwork with recycled glass countertops and backsplashes. Daylighting sensors control the general ambient lighting and the new appliances selected are Energy Star rated. There were mainly two members on the design team – A project manager and myself as the designer. I worked closely with the contractors in researching materials, producing construction documentation, providing design input throughout the construction process and developing required LEED certification documentation. The LEED documents included daylighting calculation & plans, view calculations, plans & elevation as well as public transportation map.